We are (happily) staggered by a wealth of little-known collections with shoes, boots and slippers, which we have been fortunate enough to visit this summer. Many wonderful winter hours of archival research await. However, with a number of deadlines fast approaching, ample time is elusive. Therefore, kind readers, please indulge us as we post images with limited information at this time, knowing that you will learn more as we do and as time permits. This post is the first of several highlighting our summer travels. (43 Middle Street, Portsmouth, NH. USA www.Facebook.com/JohnPaulJonesHouse) initially to look at a pair of shoes from the shop of London cordwainers, Chamberlain & Sons, Cheapside; we have now returned on several occasions to view this fine collection of historic footwear. collection of Historic New England. contrasts with the decades earlier, thicker Louis heel. Note metallic "spangles" ornamenting the toe. a high level of finish detail. Note the very low leather heel. Pink kid slipper, printed with stylized, geometric floral motif, c. 1780-1790s. Please note, all images are courtesy of the Portsmouth Historical Society. The artifacts in this post are not currently on view- contact the Curator at the above links for access. How plainly I can see those dear County Street parlors as thee describes them, and oh! How inexpressible are my longings to look in upon them and their dear inmates . . . the ties that bind us to home, are very strong and not easily severed. In July 1843, Rebecca Chase Kinsman (1810–1882) departed her home port of Salem, Massachusetts for Macao and Canton, China, with her husband, Nathaniel Kinsman (1798–1847), and two of their three children, Nattie and Ecca. Nathaniel was taking up a position in Canton with the trading house of Wetmore and Company, and the couple had made the decision—unusual in antebellum America—to travel together to what was then an exotic and strange world. Indeed, the diaries and letters shared between the couple offer a rare glimpse into an early American household that challenges conventional interpretations. The written record for the Kinsman family is particularly strong. Not only have a decade of letters between husband and wife and their respective families survived, but also household receipts, diaries, and Nathaniel’s ship logs are among the rich collection housed at the Phillips Library at the Peabody Essex Museum, the Schlesinger Library, the Smith College Library and in private hands. However, in order to place the family’s personal and professional lives in a larger antebellum New England context, this article will focus on Rebecca’s diary entries, in contrast to her letters, providing a special opportunity to investigate the issue of the domestic lives of early American women travelers and expatriates. Rebecca used her diary in a number of ways and was clearly cognizant that her travel to China marked an important episode in her life: indeed, after her return to the United States, it is exceedingly difficult to unearth any subsequent information about her. She used her diary to record her experiences in Macao, Canton and Manila, and on her voyages to and from China; as a day book tracking household expenses; as a place to record her detailed observations and her daily frustrations with not only the management of a household staff whose language she did not understand, but also a medium to vent the longing for her “dear absent hubby;” a place where she recorded what she was currently reading, what letters and packages have been received (or not) from home and her thoughts on the local denizens: dress, habits and so on, as well as her reactions to sermons and visits, social events, and walks. When compared to her letters home (detailed and chatty, but also reflecting homesickness and concern over the current divisive nature of Quaker meeting, local politics, and health of absent friends) or her letters to Nathaniel (she was more open in these regarding daily struggles and concerns for his health and well-being of their children), her diary operates in a middle arena. It is sporadic commentary which “spikes” for important events and trails off when life is “routine” in Macao or Canton. The letters and diaries shared between Rebecca and Nathaniel offer a rare glimpse into an early American household that challenges conventional interpretations. 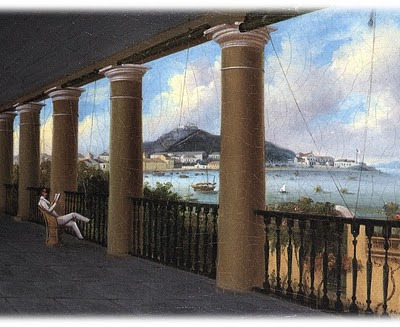 They reveal Nathaniel as a sensitive, romantic figure, who was ill at ease in the public sphere of business and who sought solace in the private sphere of family, while Rebecca, on the other hand, was the stronger partner, supervising a household of Chinese servants, arranging travel, and even organizing a reception for visiting Plenipotentiary Caleb Cushing in 1844 for the signing of the first trade treaty between China and America. This article is part of a larger study of the Kinsman family in China, situated within two strains of recent historiography—family history and travel narratives. A number of studies have examined marriage in the new nation, most recently Anya Jabour’s Marriage in the Early Republic: Elizabeth and William Wirt and the Companionate Ideal (1998) and Timothy Kenslea’s The Sedgwicks in Love: Courtship, Engagement, and Marriage in the Early Republic (2005). 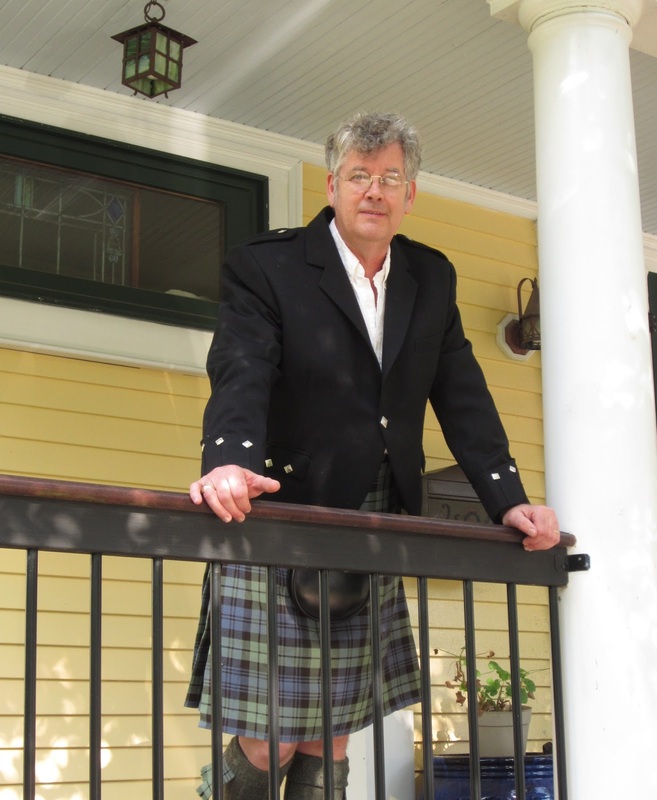 Over the last decade historians have focused on travel narratives of both men and women. However, this exploration into the lives of the Kinsmans provides an unparalleled opportunity to marry both themes—investigating travel narratives and domestic life simultaneously and placing them within the context of an antebellum New England family and their experiences abroad. 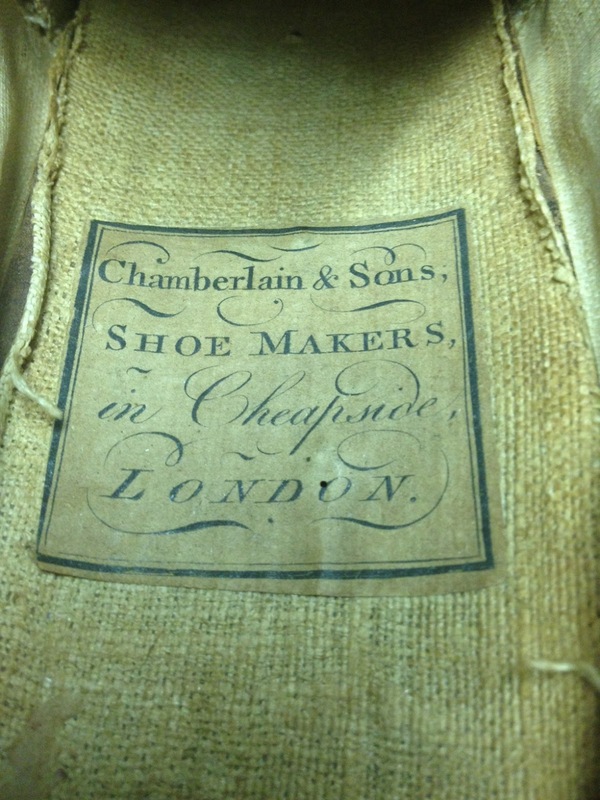 Several colleagues have requested a specific bibliography on shoes. Below is my own, subjective, selection of favorites. ^ This slim volume is an extremely well-written and well-sourced with some rare images from the National Trust Collection at Snowshill. ^ A gem, must have! ^ This is my go-to book on shoes and a constant inspiration from a true master. ^ A thorough book by a leading light in the field. Would love to see an updated version with more color plates! ^ Walford's title lives up to the imagery and text found between the covers. Although not specifically about shoes, Colonial Williamsburg's What Clothes Reveal by Linda Baumgarten, is an especially useful source book. 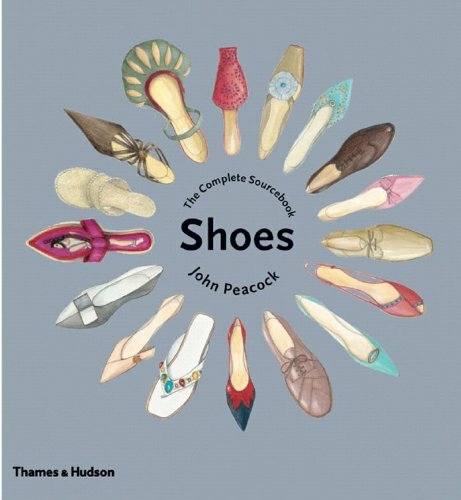 There are of course numerous books on specific designers. 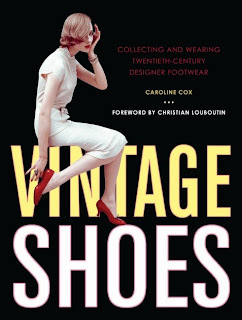 One of my current favorites focuses on Beth Levine (1914 - 2006) who was considered by many to be the first successful female shoe designer in an era and field dominated by men. 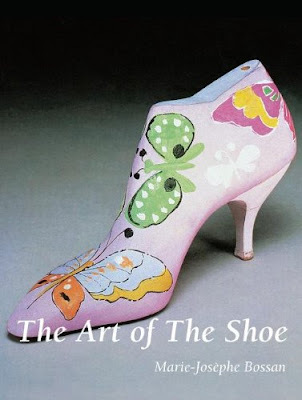 It is always advisable to check museum catalogs over time - the Bata Shoe Museum, the Metropolitan Museum of Art, the Northampton Shoe Museum, the Victoria & Albert and so on. This bibliography does not enter into primary resources, although they are posted periodically and randomly on this blog. 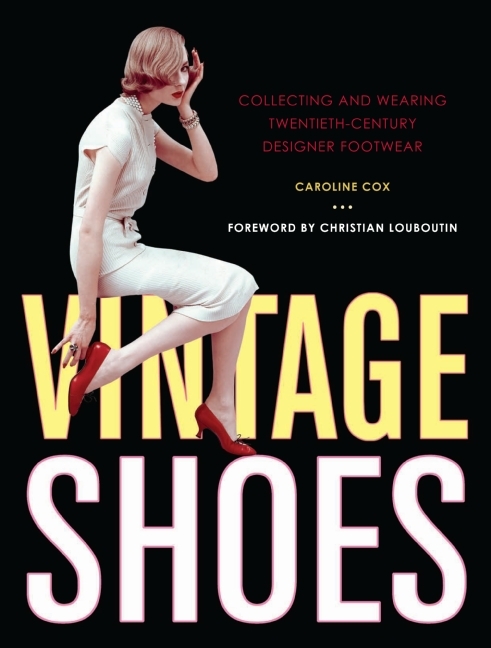 Vintage Shoes is on my to read list this summer. 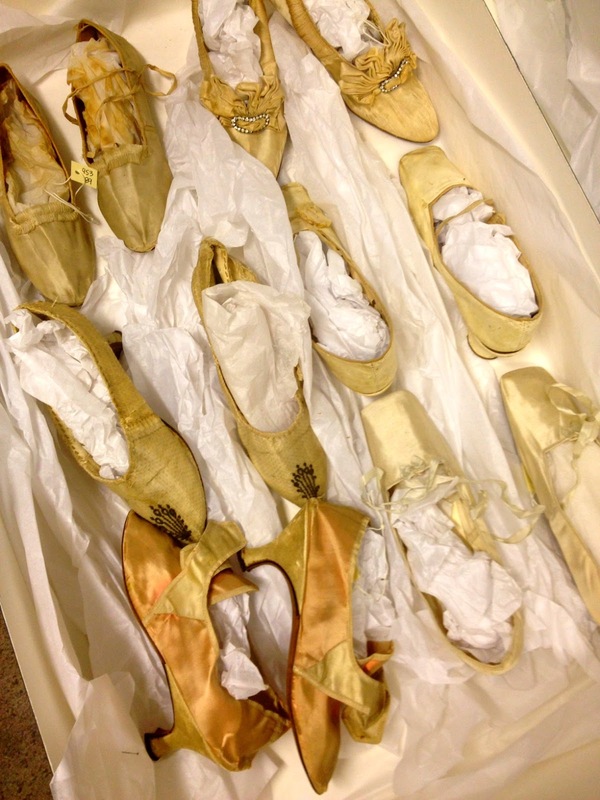 Enjoy some serious shoe scholarship and some serious foot candy! On April 14, 1870, William Briggs Kelley, a member of the Sons of the American Revolution, married Lucy Breed Hacker, both of Lynn, Massachusetts. They were married on a Thursday of a typical New England, balmy spring day. The bride wore this three-piece, gray silk taffeta wedding suit, with a gathered train. It boasted the high style silhouette of the 1870s, with the fullness of the skirt that was typically found during this decade. 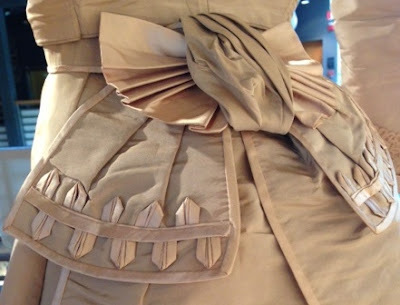 The short-waisted jacket has, what was once, white lace and satin ribbon decorating the wrists and collar. Tatting covered buttons run down the front. Upon close inspection, barely noticeable pinhole marks at the neckline above the buttons offer a clue that a brooch, possibly a cameo, was the chosen piece of jewelry for that day. The notable third piece to this ensemble is the elegant, detachable silk taffeta bow with satin ribbons that cascade down the back of the skirt highlighting its fullness. (Above) This wedding suit was an unconditional gift to the Lynn Museum & Historical Society in 1981 along with a pair of white kid, heeled wedding slippers, a piece of white netting (possibly for a veil) and artificial flowers all used to decorate the wedding suit to be worn on the wedding day of Miss Hacker and Mr. Kelley. This suit is typical of middle-class “best” gowns worn in the 1870s. The young bride had a 13 ½ inch waist and wore a common shade of gray typical for wedding attire of this time because it was a useful color to re-use as Sunday best. Whether the overall pale color of the fabric or the petite frame of the dress, one can sense the youthful, innocence of the bride. The suit is delicate and classically elegant, an ideal that lends itself to the uneasy, nervousness of youth heading into a lifelong commitment of marriage. This wedding suit is currently on view in the Lynn Museum’s wedding dress exhibit “Tying the Knot” through September 28, 2013. Drawn exclusively from the Lynn Museum’s extensive Textile Collection, “Tying the Knot” highlights wedding dresses worn by Lynn brides over the span of 100 years. This exhibit also includes church and wedding photographs from the Museum collection with a special addition of photographs that have been submitted by the Lynn community. “Memoirs,” Register of the Lynn Historical Society, Vol. 26.1, 1934.